Jessica and Dale were married back in November in Wake Forest with a ceremony at St. Catherine of Siena Catholic Church and reception held at The Sutherland, planned by Nicole with Erin McLean Events. 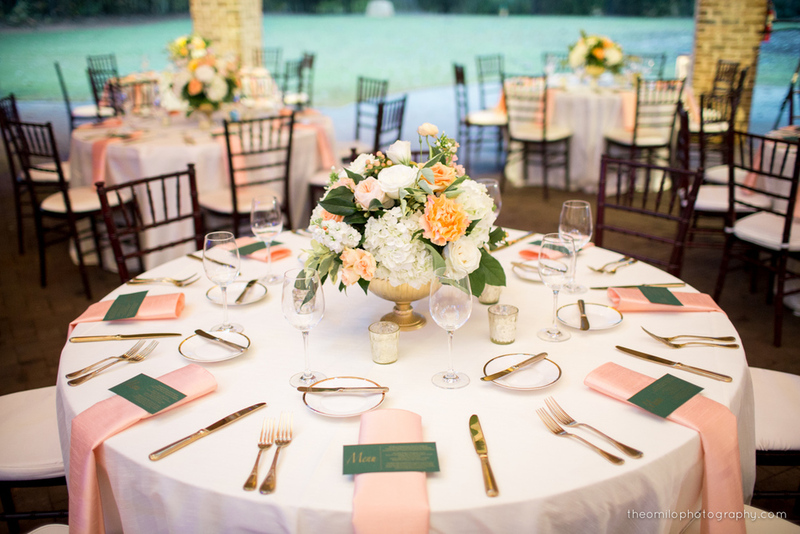 Jessica had a vision of emerald green and rich orange toned blooms and greenery. We used several different varieties of roses and garden roses, spray roses, hypericum berries, ranunculus, stock, white hydrangea, ligustrum and lemon leaf to cream gold compotes for each of her guest tables. A unique detail to this wedding was a moss covered installation of the couple's new monogram accented with floral clusters. And Jessica and Dale's head table included multiple floral compotes, candles and romantic jasmine vine added to their sweetheart settee provided by Themeworks. Check out our favorite images by Theo Milo Photography below!